It seems like every store I visit these days charges for plastic bags. I have finally gotten into the habit of carrying a reusable shopping bag with me for all those times I decide last minute to stop at the store. It may not seem like much, but paying for a plastic bag will add up and just seems silly for me to waste money like that. If you are in need of a reusable shopping bag, then you need to check out Envirosax. This is a company that believes in helping our environment by offering consumers an eco-friendly alternative to the disposable shopping bag. Envirosax bags are lightweight, portable, waterproof and each one holds the equivalent of two plastic shopping bags due to the reinforced seams. And they are fashionable! Approximately 380 billion plastic bags are used in the US each year. That works out to more than 1200 bags per US resident, per year. Only 1 to 2% of the plastic bags in the US end up being recycled. Thousands of marine animals and more than 1 million birds die each year because of plastic pollution. After reading these stats, it just reiterates to me how important it is for our family to only use reusable shopping bags! Graphic series- Brightly coloured with funky pattern bags that are made from polyester and available individually or as a series of 5 bags in a handy pouch. 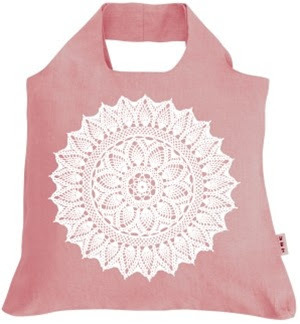 Organic series- Bags are made from certified organic cotton, bamboo, linen or hemp. Kid series- Fun designs that your children will love. Greengrocer series- Plain coloured, ultra-strong polyester, ripstop bags that are both simple and functional. I received the Linen Bag 5 for my review. 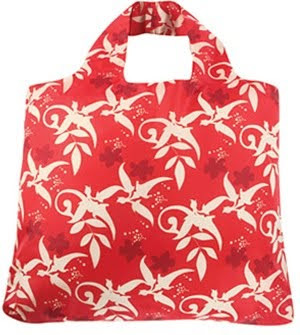 This bag is cream coloured with a red owl print. It is made from 100% linen. Did you know that linen may be the oldest textile in the world? I didn’t! My bag came in a small pouch that fit easily into my purse. When I went to the grocery store, I just pulled the sac from my purse and took the bag from the sac and voila, I am ready to pack up my purchases. It is a good sized bag and you will able to fit lots of groceries in it. It is also very strong and I put some heavy cans in there and it held up fine. It is a very durable fabric that can take a lot. 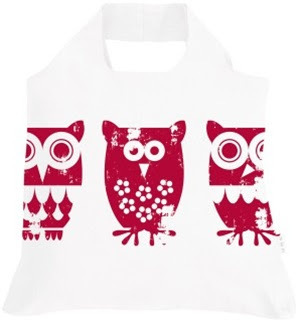 Plus, it is a cute design- love the owls! This bag will cost you $24.95 from the Envirosax website. I think its a good investment and one that you will get continued use and benefit from. I like knowing that our family is doing our part in helping the environment. I would like to try some of Envirosax’s other bags- maybe bamboo? I’d like to have the Sesame Street – Cookie Monster one. God! I must be mad!!! This is from LAST YEAR!! LOL..